Earlier this week images of a Supreme x Nike Air Max 98 were previewed for the first time, and as more pictures surface it looks to be the next big collaboration of the New York City skate brand. Instagram user sneakermaniastore, shared another detailed look at the sneakers. 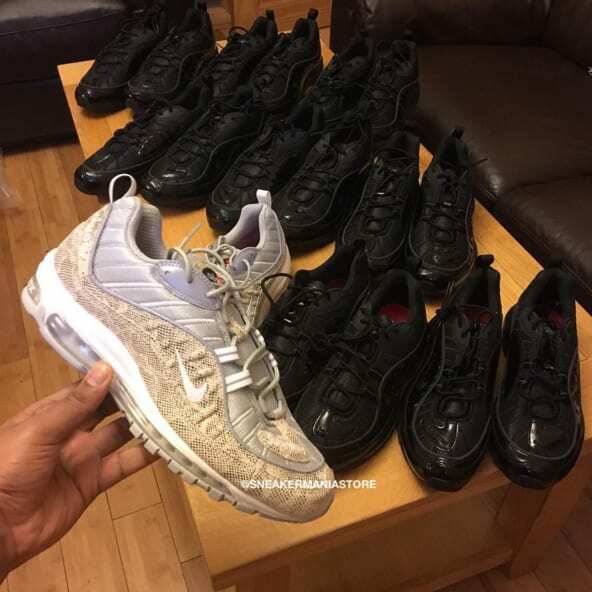 Unlike other Nike silhouettes used in previous Supreme collaborations such as the Air Force 1 and Air Jordan V, the Nike Air Max 98 doesn&apos;t have a huge amount of popularity mainly because it hasn&apos;t seen many releases – its first retro was in 2014. The Supreme x Nike Air Max 98 has been seen in two colorways – black with patent leather and grey with faux snakeskin, both feature 3M accents. While there is no official release information on the Supreme x Nike Air Max 98, it wouldn&apos;t come as a surprise to see it release some time during Supreme&apos;s Spring/Summer 2016 collection. Stay posted for more information.